Doctor Who: The Moffat Scripts - TWICE UPON A TIME | Warped Factor - Words in the Key of Geek. The Twelfth Doctor is dying but he doesn’t want to. His final episode has one job to do, getting him from that point to one where he accepts his regeneration and begins a new life. By having the regeneration already underway before Twice Upon a Time starts, Steven Moffat has played a blinder. He doesn’t need to spend time kicking-off the change this time and he’s got a clearer slate to play with. Why not throw in another Doctor suffering from a similar situation and have both incarnations play off each other for a bit? 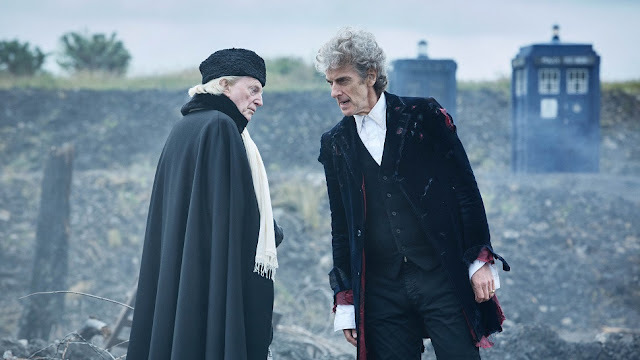 Step forward David Bradley as the First Doctor, replacing the late William Hartnell with an uncannily good performance. If Hartnell could see what Bradley did with the part, I think he’d be proud. This whole episode feels like a love-letter to that era, with noticeably more time spent in One’s TARDIS than Twelve’s. The episode begins from his perspective, with accurate recreations of missing scenes from The Tenth Planet. And then there’s the Mark Gatiss character, not strictly from the Hartnell era but a major character from the classic series who would debut in the late 60s. 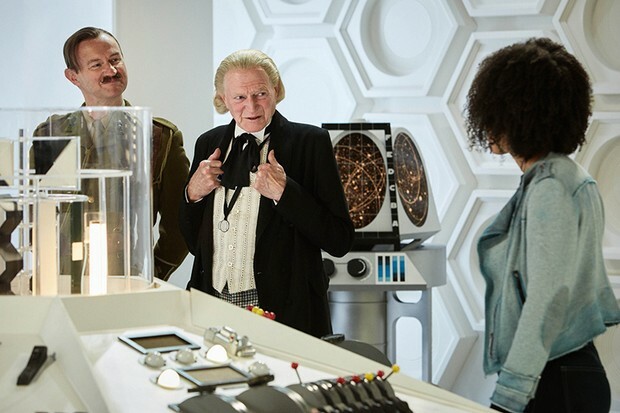 Gatiss plays the Brig’s granddad, and he’s saved from death in WWI from two of the Doctor’s incarnations. When they agree to check in on his family for him we get a possible retcon for why the Doctor and Brig spend so much time together. But this is also a love-letter to the Capaldi years. Bill Potts’s return is the most noteworthy example. Pearl Mackie is not strictly playing Bill so much as she’s an alien entity using her memories to effectively bring her back from her eventual death. Having her play off the First Doctor and reunite with the Twelfth is both excellent fanservice and a justice being done for the one loose-end left over. She’s not the only one either. 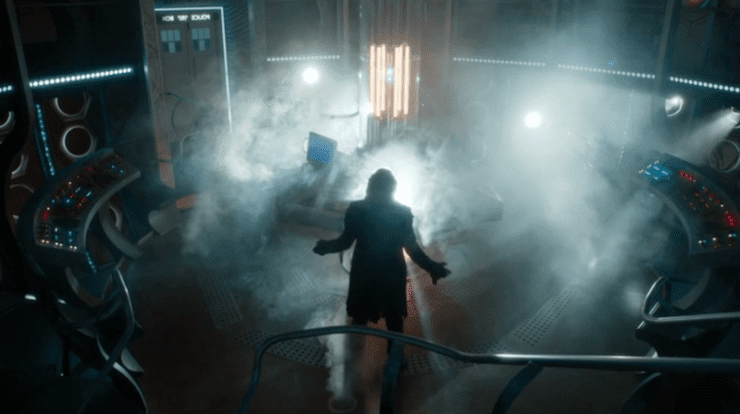 Using the power of memories we get a couple of seconds of Clara Oswald and her memories returned to the Doctor. 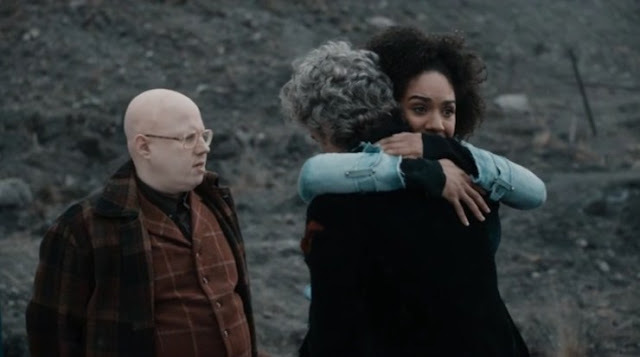 We get Nardole and Bill to share a hug with the Doctor again. The three of them encouraging him to accept his fate as they share an embrace is a hard-hitting and powerful moment that hits the right balance between emotion, fanservice, and good storytelling. Better this than any farewell tour. Justice is done by these characters. And that’s fantastic. Safe to say that the Twelfth Doctor wins the battle between each incarnation for which one had the best set of companions and it’s nice to see them all here. It reminds me a bit of Peter Davison’s regeneration where all his companions communicate with him and help him regenerate. In spite of everything going on, Peter Capaldi owns this show. Only right really, this is his finale before anything else. Every second he gets on screen belongs to him and he commands it. Capaldi utterly convinces on his character arc as he progresses from the man who is too fatigued to keep going to the man who lets go and becomes someone else once again. The Doctor is dead. Long live the Doctor. 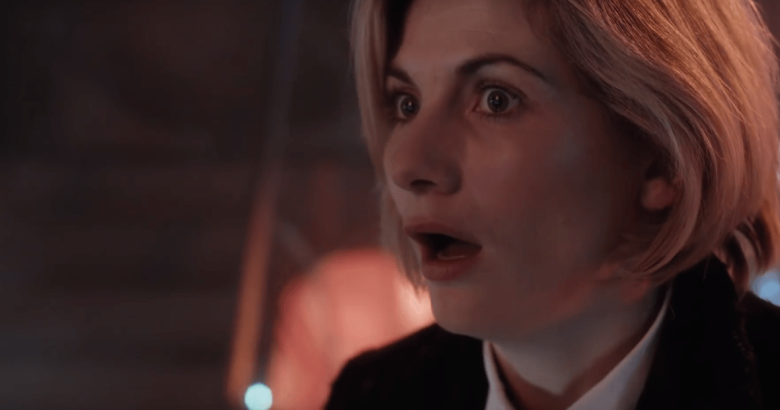 If this level of excitement and joy is what we can expect from this Doctor then she’s gonna be one of the all-time bests. Change, and not a moment too soon. She is the Doctor whether you like it or not. I for one can’t wait to see what Whittaker’s like when her first series rolls around. Until then however, we have so much more material to enjoy. All the Twelfth Doctor’s episodes for starters. All of Moffat’s. What a great pairing these two have been. It’s a shame it’s over, but I’ve loved all of it. Thank you Steven, thank you Peter. Splendid fellows. Both of you.